Our base at the historic Nelson's Dockyard in English Harbour is the perfect starting point for an Antigua sailing itinerary. With 365 beaches, one for each day of the year, you will be spoiled with all of the choices on your Antigua Yacht Charter. And just 30 miles away is Barbuda, so beautiful and undeveloped that it almost seems deserted. What a great start ! Stunning location, English Harbour is a sheltered natural heaven. Try the English pub for typical British food with a caribbean twist. English Harbour is a Caribbean haven rich in maritime history. Its location is stunning; a sheltered natural haven, cutting deep inland and fringed with lush forests and steep cliffs. In the 18th century, the Royal Navy's Caribbean fleet was established here and it duly became a key naval base. The entrance to the main harbor is surrounded by two fortresses standing on either side. On the surrounding hillsides you'll find ruined forts, gun batteries and old cemeteries as a testimony for the former military outposts. As a residential settlement Antigua is tiny, not much more than a scattering of houses and businesses, but the harbor area in its entirety encompasses a unique and diverse landscape of waterfronts, slipways, mangrove swamps, beaches and woodland. The whole area is designated as a National Park, with Nelsons Dockyard a must-see. There is plenty on offer at Nelsons Dockyard, including shops, upmarket restaurants, boutique hotels and some very nice bars. Beyond Nelsons Dockyard is English Harbor, offering plenty of other charms and attractions, with an English pub serving hearty British pub food with a Caribbean twist, amongst a whole host of other restaurants to choose from. There is a museum where you can learn all sorts of interesting facts about Admiral Lord Horatio Nelson, and the building project that he had on his hands when landing on Antigua. Join the hospitable locals at a "jump up" with steel bands, take advantage of the duty-free shopping, partake in the local rum punch and get your vacation kick-started in true Caribbean style. Shirley Heights on the southern shore is a popular gathering place for the famous Antigua rum punch party with BBQ and live music. On the beautiful island of Antigua, the most famous view is without a doubt the view from Shirley Heights Lookout. On clear days, this panoramic view takes in Guadeloupe to the south and Montserrat, with its active volcano, to the south east. It can be accessed from English Harbor by a nature trail that rises through a forest of trees. As you'll soon hear from the locals, Shirley Heights is also famous for hosting the biggest and best parties on Antigua. The best time to visit Shirley Heights on your yacht charter is Sunday. Sunday nights are the real party nights, with the fun kicking off at 4pm with live bands, dancing under the stars, lots of food and as much rum punch as you can handle. As well as the barbeque food on offer on a Sunday night, the restaurant also offers excellent Caribbean cuisine. Choose to either dine indoors in the renovated 18th century building or outdoors on the terrace overlooking that amazing view. Head to Green Island, an unspoilt hideaway with plenty of excellent anchorages amongst pure white sand beaches to enjoy. Just off the east coast of Antigua is Green Island, an uninhabited, unspoilt hideaway particularly popular for its excellent snorkeling. There are plenty of anchorages dotted around this quiet little island and an abundance of birdlife to spot, such as the red billed tropic birds and pelicans to name a few. Just off the east side of the island is Nonsuch Bay, a beautiful natural harbor. The bay's clear waters are protected by a barrier reef and home to occasional dolphin and turtle. Nonsuch Bay is an area loved by sailors from all over the world because of its tranquillity and constant sea breeze. A perfect place to drop anchor and spend a day relaxing on the beach. Deep Bay is a typically beautiful Caribbean beach with picture perfect white sand fringed by tall palm trees. This is the perfect spot to drop anchor and either swim from the boat or head ashore and spend some time relaxing by the beach. It is one of the most popular vacation destinations in Antigua with beach bars and restaurants waiting to pour your next cocktail. The beach is fantastic for snorkeling. In the middle of the bay lies the shipreck of The Andes; an English-built ship that was en route from Trinidad to Chile when it caught fire on the June 7, 1914. The wreck is in easy reach of divers and snorkelers and is teeming with marine life. Sometimes, when the tide is low, the ship's mast emerges out of water. If you want to stretch your legs then you can take a 10-minute hike to Fort Barrington that sits on the northern end of the bay. The fort, dated about 1779, used to protect the southern approach into St. Johns and you can see its fortifications today. The main commercial center, St. Johns, is the capital of Antigua on the western coast. It is also the main cruise ship port, so it's a bustling and busy town. There are many shops, restaurants, and galleries situated around the waterfront such as Redcliffe Quay. 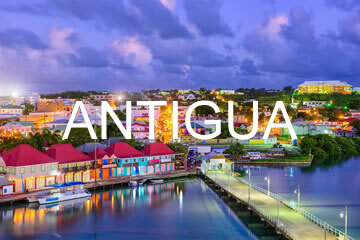 The main attractions are St. Johns Cathedral built in 1845 (previously destroyed by earthquakes in 1683, and again in 1745), the Museum of Antigua and Barbuda (located in the colonial courthouse) and the local market that takes place every Friday and Saturday morning. Made up of over twenty small islands and numerous reefs. Hike to the summit for spectacular views and the opportunity to spot a variety of tropical birds and West Indian whistling ducks. 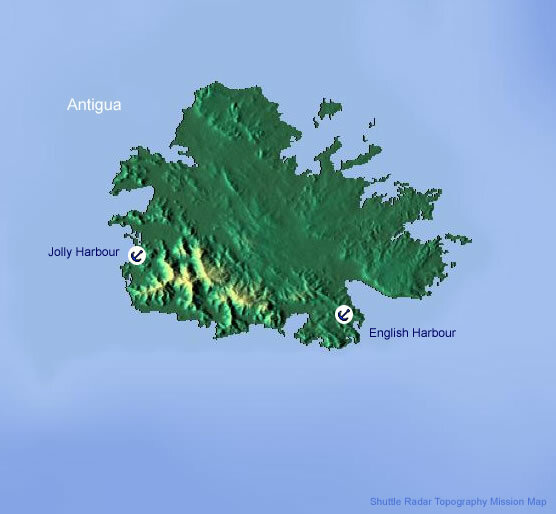 Great Bird Island is generally regarded as a "desert island" dream. During the day though, it does attract passing tourists, but at night, if you're lucky enough, you may get it all to yourselves. White sand beaches at either end of the sandbar are the main attraction for visitors, as well as the lure of seeing the Antiguan Racer snake. This is the only place in the world that you can still see it in the wild. Great Bird Island is also home to a variety of endangered species, including brown pelican, exotic red-billed tropic birds and West Indian whistling ducks. Parham, once the capital, has an anchorage and has for some interesting walks around it. The walk to the top of the island will reward you with some fantastic views of Antigua and the surrounding islands, as well as the experience and thrill of looking straight down a naturally formed blowhole. Great Bird Island is actually part of a group of small islands, known as the North Sound National Park. Rabbit Island, located nearby, is home to the brown pelican. On Long Island, the Hawksbill Turtles have been the object of a successful project, designed to monitor the animals to come to the island and lay their eggs. Great Bird Island is without a doubt one of the best places in Antigua for snorkeling for its rich marine life, promoted thanks to the large concentration of mangroves. After a strenuous snorkel around the reef, the beach here is just crying out for you to take comfort in one of the low lying tree limbs and be one with nature. On your way back to the base, you have to make a stop at Carlisle Bay. Situated in the center of one of the most beautiful bays imaginable, the beach here is sheer perfection with water so clear you can see the red tropical fish as you paddle. Carlisle Bay is quite simply stunning. A great expanse of beach with pristine white sand, clear waters, amazing rainforest and rolling hills. It's the ideal location to do as much or as little as you like. Carlisle Bay offers a whole host of activities. It is also the location of Carlisle Bay Resort, the sister hotel to the award winning One Aldwych in London. This resort not only offers a completely secluded and luxury vacation to its guests, it also has two of the finest restaurants on the island, and a range of bars to suit everyone. Carlisle Bay is set in a beautiful area that offers an outstanding amount of natural wildlife. Sat behind the exquisite beach, in front of the surrounding hillside, is a mangrove lagoon historically known as "The Old Road Fish Ponds". The mangrove acts as a spawning ground for many species of salt water fish, including the snook and tarpon, making it a favorite hangout for herons and egrets. The best way to see this wonderful selection of species in their natural environment is by kayak. This is a real David Bellamy adventure. The anchorage at Carlisle Bay is safe and easy to navigate. Although coral lines the shore, the center is calm when wind is not out of the east and has a clear bottom. Other anchorages nearby that are worth visiting are Rendezvous Bay, Johnsons Point or Crab Hill Beach; the latter of the two are renowned for their lively beach bars. Back at English Harbour! A great way to finish your sailing trip.